I am humbled and at awe when I visit these special places; they are truly a place where you can slow down and learn to see instead of just look, to actually listen instead of just hear. These places are the perfect playground to capture the “light at play”. Merriam-Webster defines photography as “The art or process of producing images by the action of radiant energy and especially light on a sensitive surface (as film or an optical sensor)”...producing images by the action of light – I like that! 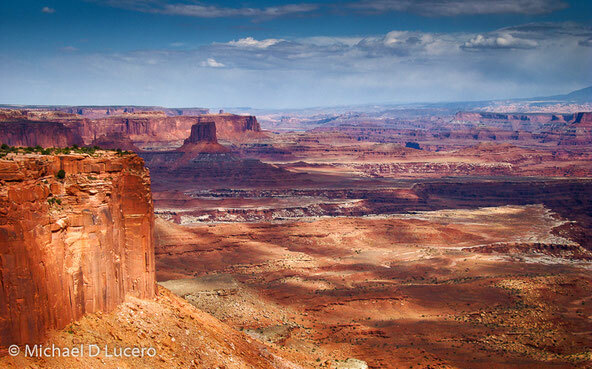 I have this spot I often visit that overlooks Canyonlands National Park. I’m sure there are hundreds of other spots on top of the canyon rim that would do, but this has become my chosen spot. I can sit there and take a deep breath, listen to the quiet; it is awesome. It is one of those places where after looking around for a while you begin to see. For me it is a place where I can begin to reflect on the “vastness” of it all, and humbly ponder my place in it. Part of my art making process is the act of being out in the open land and skies; of being out in the drama. This allows me to find that wonderful orchestration of natural design elements and put it into a single image. To be able to turn down some unknown road and follow it chasing the light, the texture, the movement, and finding the beauty these elements can create at any given moment is what keeps me going on the hunt. It can happen anywhere, and our public lands give me the opportunity to explore almost endless possibilities. Hopefully sometime soon you too will have the chance to go and find your own light!